This past July I have had the opportunity to work with the social enterprise, Pollinate Energy, through the Business School's Community Placement Program. 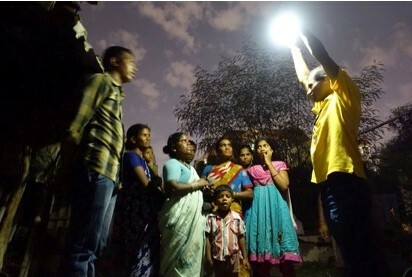 Pollinate Energy aims to improve the lives of India’s Urban poor. 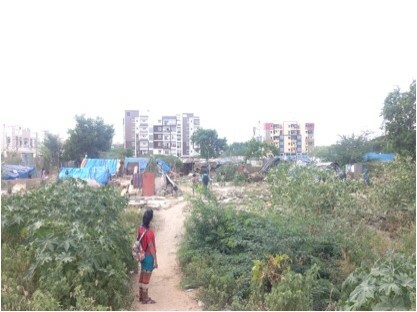 Every year, thousands of Indians are migrating from their rural villages to these urban slums. 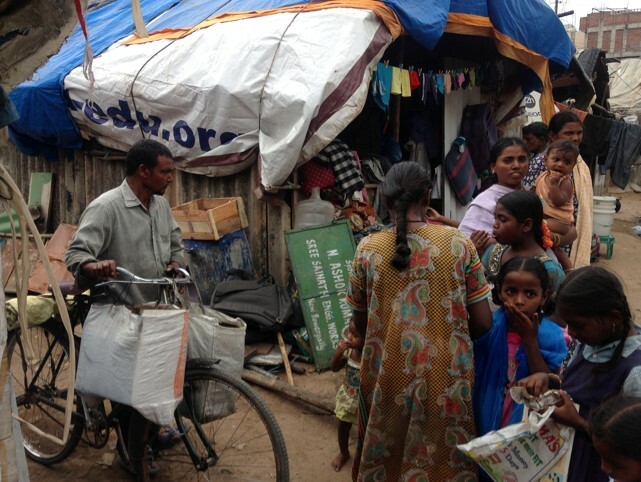 These people are seeking employment and these harsh living conditions, often without electricity, act as a gateway to the city. 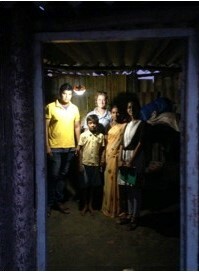 Pollinate Energy helps these people by employing locals to sell them solar lights and fuel efficient cookstoves. I was placed in Hyderabad, the first city for Pollinate to expand their working model to in Bangalore. The program ran for four weeks where we worked on different aspects of the organisation in a group made up of ten kiwis and aussies, and six local Indians. 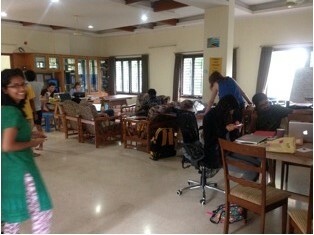 The international students were all living together in an apartment called the ‘Hive’ which doubled as our work space. 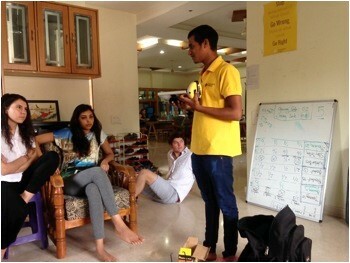 We were split into three different working groups, each with a mix of international and Indian students. I was lucky enough to be in the team that was coaching the new ‘Pollinators’ – local’s who want to help, and are looking for a job. By targeting this demographic, those in the slum communities are more likely to relate and can more easily communicate with the Pollinators. At the same time it’s giving someone a job, skills and an international network which is quite rare for these people in a place like Hyderabad! My training partner was Shanti – she might look cute but she was tough coach. She also acted as a translator between Vinay (our Pollinator) and I, translating both Telagu (the local language) and body language. I learnt that the Indian head wobble meant anything along the lines of yes, no, maybe, I’m listening to you but hurry up and finish and I’m telling you yes but I’m not going to hold my promise – something I found quite frustrating not understanding! In the mornings we three would get together and discuss the what had gone well the day before, and where there was room for improvement in Vinays sales techniques. A big challenge we faced was developing trust between us, and those we were trying to help, as they had never had any kind of interaction with Pollinate before. In the afternoons we would head out to a selection of his designated slum communities, which were randomly scattered amongst the high rise buildings in the city or near new construction sites. The contrast was incredible. The approach to business is completely different in India and it definitely took awhile to adjust. For example, what’s considered rude and what isn’t. Apparently it isn’t considered rude to answer your phone mid-way through a sale of a product? 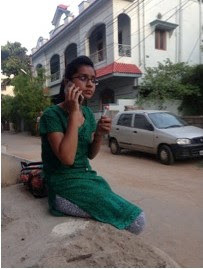 Calling your employer the day you are heading to your village for a week long festival is not uncommon. And as for the stretchable nature of ‘Indian Standard Time’ the difference between 5 minutes, three hours, two days late or a day early to an interview is minimal – oh and your welcome to bring a mate. All these things become less surprising when you start operating in the same environment. People in the communities were extremely welcoming, pulling out chairs for us to sit on and offering us food. 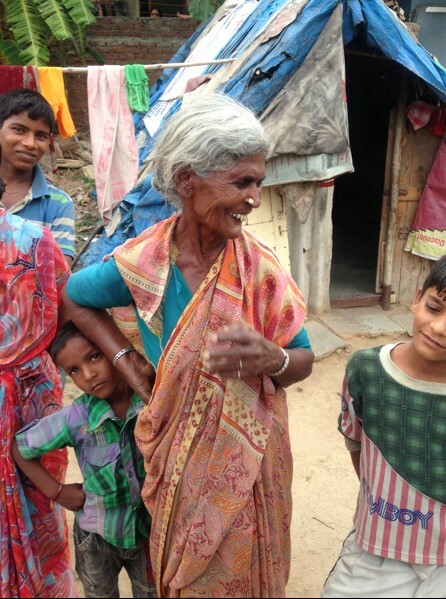 They take such pride in their huts, it’s difficult to not feel guilty for being treated so well, when the average wage is less than $2 a day, but it actually means more to them if you accept their offers. This cute woman even did Henna for me! She saw me watching her pluck leaves from the tree and grinding them into a paste for her daughters, so invited me over to have it done. I would highly recommend this program to anyone considering a career path in renewable energy engineering, an interest in social enterprise, or even just for personal development. 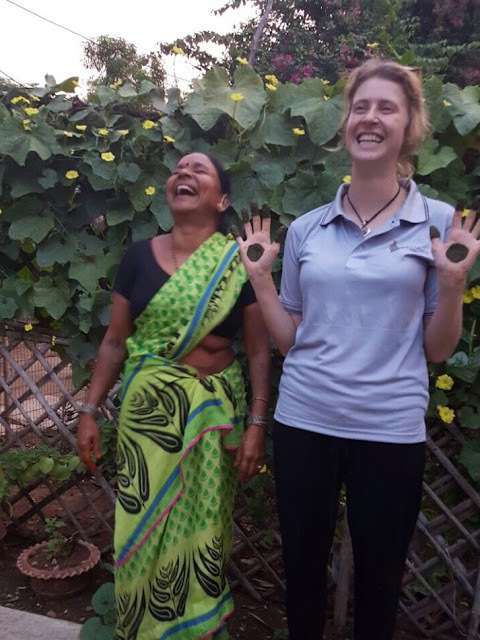 The $2,000 Pollinate Energy Community Placement Scholarship from the University of Sydney was a huge help in getting me to India. It was such a challenging but rewarding experience where I directly saw the impact Pollinate is making. Although it was sad saying good bye to the Pollinators we still keep in touch on whatsapp, see who has sold the most lights and make sure the ‘Hive’ is still buzzing!